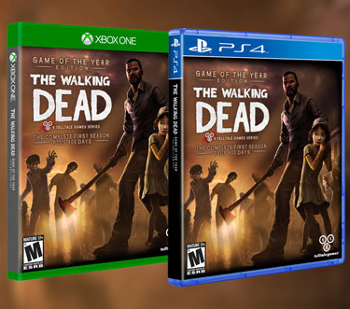 PS4 and Xbox One get adventurous with Telltale's The Walking Dead and The Wolf Among Us later this year. Immediately after releasing the fourth episode of The Wolf Among Us, "In Sheep's Clothing", developer and publisher Telltale games has announced that they are bringing two of their franchises to next-gen platforms. On the Telltale blog, the company announced The Walking Dead: Season One and Season Two as well as The Wolf Among Us will be released on PlayStation 4 and Xbox One later this year. Additionally, The Walking Dead: Season Two and The Wolf Among Us will, at some point, make their way to PS3 and 360 in disc form. Both The Wolf Among Us and The Walking Dead: Season Two are incomplete at this time. Fans are still waiting for the final episode of The Wolf Among Us and two more episodes of The Walking Dead: Season Two, so a fall release of the disc versions of these titles seems most likely. Telltale hasn't said if the episodes of The Wolf Among Us and The Walking Dead: Season Two already available on other platforms would be made available on PS4 and Xbox One ahead of the retail disc releases. Telltale is certainly busy, with two popular episodic franchises releasing episodes and two others, Tales from the Borderlands and a Game of Thrones series, currently in the works. The company seems to be happy to reach as many platforms and methods of distribution as possible. The Walking Dead: Season One and Back to the Future both saw releases on consoles after success with digital distribution on PC, Mac, consoles, and mobile devices.